The ink is barely dry on Giorgios Letsos's divorce papers, but there's only one thing on this unstoppable Greek's mind: finding Billie Smith, his mistress before his marriage. But the sweet, pliable woman he once knew slams the door in his face! But she hadn't counted on just how badly he wants her back in his bed! 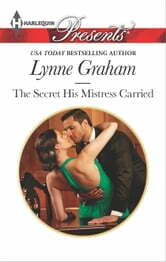 I only read Lynne Graham harlein books. This story grabs you right from the begining and keeps you caught until the end. In a couple of instances when I thought the plot would go one way it went the other. It was decently pleasant to read.